The other day, I went to a football match (European football of course!) with my study abroad program. I’m a huge soccer fan, having played from age 5 through high school, so I was more than thrilled to be going! 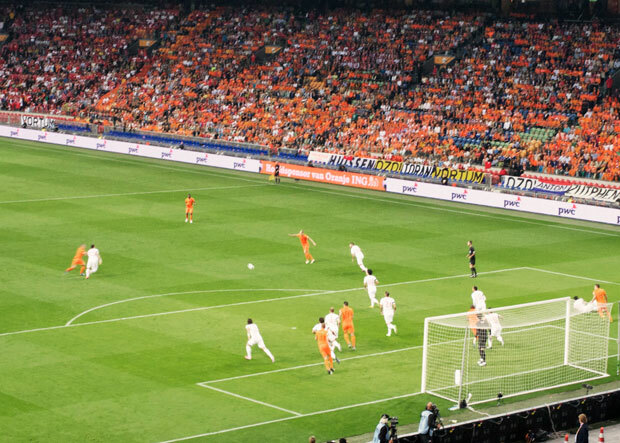 It was a World Cup qualifier between Holland and Turkey. After that introduction, I could only imagine what it would be like in the stadium! The stands were full of orange and the raucous singing and stomping that had begun on the metro only got louder and, impossibly, more enthusiastic. There were fireworks and smoke whenever a goal was scored, which didn’t seem particularly legal, but nevertheless made for an interesting experience! The match was terribly tense, with Netherlands finally winning 2-0, scoring it’s last goal within minutes of the final whistle!